The genome used for Creatures 2 (in particular, the norn genome) was the subject of much controversy, particularly in alt.games.creatures. Cyberlife chose to contract the work of creating the genome to a member of the community that they felt had the skills for the job, Sandra Linkletter (commonly known as slink). The community was excited to learn that one of its own was providing such an important part of the next game and expected great things. Unfortunately, as development progressed, problems emerged. It is possible that slink disagreed with the objectives of the rest of the C2 team (after the events described below, she left the CC with a limerick, the final line of which was "The AL from the norn has been torn"). 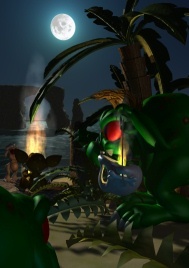 Whatever the reasons, by the time Creatures 2 was released the relationship had degraded, and arguments broke out on alt.games.creatures when people voiced their dissatisfaction with the genome released as part of the game. "Cyberlife's title to the entire genetic base of the C2 norn is, in fact, clouded. The entire organ and chemical makeup was proposed and developed by me under contract to Cyberlife, starting in late November of 1997 and ending in mid-July of 1998 (two weeks after the expiration date of the contract). Cyberlife has, however, defaulted on the written contract by paying me slightly less than half of the agreed amount and by not delivering the stock options specified in that contract." The delay in payment was due to Slink being in breach of her contract - she failed to deliver the work she was contracted to produce. Unfortunately (with hindsight) CyberLife came out of this looking like the bad guys because they failed to counter Slink's public statements. It was felt a public mud-slinging match would be harmful, but maybe the silence was more harmful. Slink continued to complain about not receiving payment, which was later sent. Regardless of the legalities of who owned the initial genome (the 252 genome version), while many people enjoyed the game out of the box, others - particularly those who had played the original Creatures - were unsatisfied, claiming to be experiencing major defects, including a loss of female reproductive ability and the inability to teach norns to eat (inspiring fixes such as Eat you Stupid Norn) or to retain this knowledge, a condition later dubbed One Hour Stupidity Syndrome (OHSS). To address these concerns, Cyberlife decided to make some changes and an update was announced, but both slink and Lis Morris attempted to fix the problems with their own modifications to the genome before the official release. The official update was planned for the 17th of September but was moved to the 22nd at the last minute, while slink released her update on the 16th. Lis was credited on the official update, (the 254 version) and not slink, yet according to her there was some evidence to suggest that attempts had been made to retrofit slink's later work to the official update; in particular, the fact that release of the update had been delayed after slink announced her modifications, and that the updated genome produced a chemical that was not used by it, but which was used in slink's modifications. Toby Simpson said that work had indeed been "inspired" by other people's work (including slink's) but that the specific changes that slink mentioned had been made in an aborted attempt to make the two modified genomes compatible with one another. slink contended that her work had been stolen and the theft inexpertly covered-up. The issue was complicated by the fact that both parties were working off slink's original genome, and was never really resolved - Cyberlife simply stopped posting about it after a month or so, as did slink a little while later. The 254 version is still available for download on the official site: information, Direct download. According to Cyberlife, Lis contributed the myoglobin mechanism (which deals with muscle creation and destruction), and altered anaerobic respiration (energy creation) genes, but not the Upatrophin/Downatrophin modifications. Upatrophin and Downatrophin are responsible for making creatures use the 'uphill' and 'downhill' gaits - in the original 252 genome, they were swapped, leading to creatures trying to use the 'downhill' walk when walking uphill, leading to mobility problems. According to GermanCreatures, there were numerous versions of the 'C256' genome available. The '56 genome update', available at AmberCreatures, is an earlier edition of other '56' genomes. There are different times to begin each life stage, and it has a basic reward and punishment system. The norn genomes included with The Albian Years are dated from October 1998 and later. They include improved reward systems from the Amnesia Norns. According to Lis Morris, a Frog Norn genome is very similar to the Golden Desert Norn genome, but amphibious. The norn genomes included with the Genetics Kit at the CDN are dated from November 1998 and later. The Santa Norn included with the Creatures 2 Christmas Pack (December 1998) is a variety of the C256 genome which is infertile, but is said to be extra-jovial. In the end the official update did not please everyone, especially those complaining about lack of sleep and OHSS; many breeders (and subsequent breed makers) later turned to the Canny Norns or LummoxJR's Nova Subterra, both of which featured significant changes in the design of the brain and associated biochemistry. slink left the Creatures Community in November, moving on to The Sims. A few months later she removed content from her website (for the purpose of freeing up space rather than denying it to the community - hosting was organized at other sites). Cyberlife distanced itself from alt.games.creatures, having decided that their posts were becoming targets for attacks against the company (although the activities of CptSiskoX may have been a contributing factor), and stopped recommending it on their sites. Instead, they provided newsgroups and (later) web-based forums at the newly-formed Creatures Development Network and Creatures.co.uk. alt.games.creatures was at its busiest at this time, reaching a level of over 15000 posts in the month of September alone. Over the next few months it fell back to the level of activity present before the Creatures 2 online marketing began (around 5000 posts/month), a level which it maintained until after the launch of Creatures 3.
slink's newsgroup thread: "My Suspicions Borne Out About CyberLife's New Genome"
Toby Simpson's reply: "A response to Sandra's concerns"
Creatures 2 Genome Downloads at an archive of the CDN - downloads themselves don't work, but some information about different genome versions. On intelligence in Creatures 2 by Venithil for the CCSF 2016. This page was last modified on 21 July 2018, at 18:05.